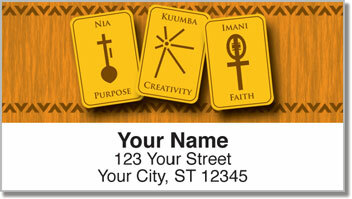 Commemorate your African heritage and start new traditions with these unique return address labels. Kwanzaa is a time for connecting with family. But we can't be with all of our loved ones every year. 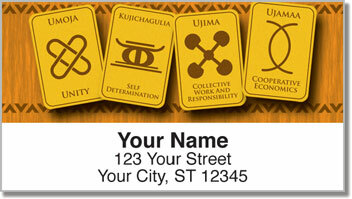 Keep in touch by sending a good old-fashioned letter and mark it with one of these eye-catching labels. 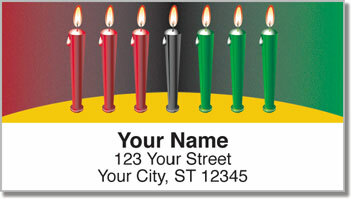 Kwanzaa Address Labels from CheckAdvantage feature recognizable images from this important holiday. Express your pride and show your joy every time you stick one on an envelope. Not only are these address labels unique, they are also convenient. Save time preparing outgoing mail thanks to a handy self-adhesive label. 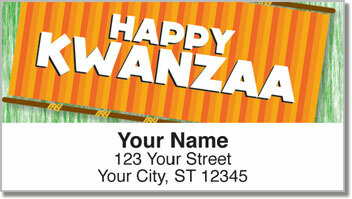 Get your very own Kwanzaa Address Labels right now! We also offer a set of matching personal checks!